Here is the seventh in a series of ten movie recommendations. Be sure to check back for the rest of the series. 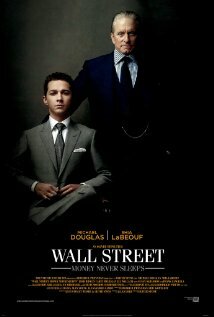 Played out to the background of the impending financial meltdown, “Wall Street Money Never Sleeps”, is a modern morality tale. Is Gecko really a reformed character or will he revert back to his old ways when the opportunity presents itself? January is the time of year when our attentions are may be focused on our new year resolutions such as getting fitter, losing weight or maybe paying off the credit card bill after Christmas. Unfortunately for many, January is also the time of year when the annual self-assessment tax return can be put off no longer. Some even resort to panic as the deadline and penalties for failing to file approach. But there is an alternative to this stress. Employ an accountant to make your tax filing on your behalf. There are many advantages to this approach. Secondly, a good accountant should prevent any last minute panics by making sure that you have timely reminders about when your returns are due, and should work with you to make sure that everything is filed in plenty of time. Remember, there are no downsides to making a return promptly and no advantages to filing at the last minute. Some accountants will even offer discounts to their fees for making a filing in the middle of the tax year rather than their busy period at the end of the year. Here is the eighth in a series of ten movie recommendations. Be sure to check back for the rest of the series. 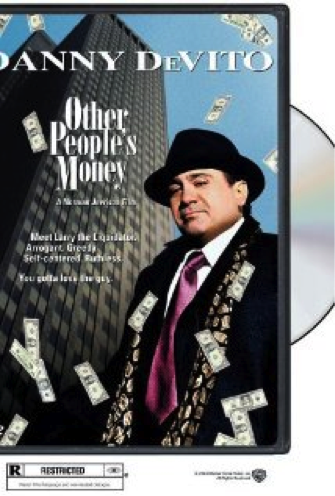 “Other People’s Money” is the tale of corporate raider “Larry the Liquidator” brilliantly played by Danny De Vito, and his attempt to take over and close down “New England Wire & Cable” – a long established family firm at the centre of a small New England town. The movie follows the financial themes of the 1980’s of infamous corporate raiders and asset strippers, identifying undervalued companies whose break-up value exceeded their stock market values. These companies would be purchased using borrowed money, delisted from the stock market, often closed down and their assets sold, resulting in the stockholders making a profit, the corporate raiders becoming very rich and the employees of the company looking for a new job. Other People’s Money tells the tale of the benevolent managing director played by Gregory Peck, and his Lawyer stepdaughter Kate played by Penelope Ann Miller, trying to resist the takeover from Larry the Liquidator, and thus preserve their company, their jobs and their way of life. Whilst following a serious plot, Larry the Liquidators romantic interest in Kate also provides for some light hearted moments and results in a highly entertaining movie. It might be 20 years old now, but Danny DeVito is still great – check out “Other Peoples Money”. 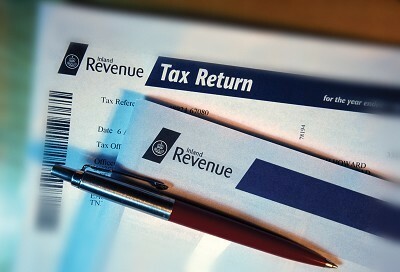 The final day for filing a self-assessment tax return for the 2011-12 tax year is 31st January. Care to know what the penalties are for missing the filing? Remember, the penalties are for failing to file a return – they still apply even if you owe no tax or the taxman owes you money. Here is the ninth in a series of ten movie recommendations. Be sure to check back for the rest of the series. “Enron – The Smartest Guys in the Room” tells the story of the 2001 collapse of the Texas based energy trading company – Enron Corporation. The movie is filmed in a documentary style and sets out the aggressive results at all costs culture of the firm that famously graded their employees and each year sacked the bottom 15% performers. Despite this, Enron was the employer of choice for the highest educated and most highly ambitious business school graduates of the late 1990s and early 2000’s. We get to see profiles of a number of now infamous senior executive including company founder and chairman Kenneth Lay, its CEO Jeffrey Skilling and its Finance Director Andrew Fastow – all since either disgraced or in prison. The films details how a combination of mark to market accounting allowing future profits to be booked immediately, offshore companies and a bull market brought about by the dot com bubble allowed Enron to grow at an incredible rate and to declare ever increasing profits, even though they were all false profits. The incompetence and complicity of auditors and accountants Arthur Anderson allowed the senior staff at Enron to grow fabulously wealthy before it all came crashing down with the shareholders losing everything. This affair led Arthur Anderson – previously the fifth largest accountancy firm in the world, with such a damaged reputation that they voluntarily gave up their license to trade as accountants and closed the company. 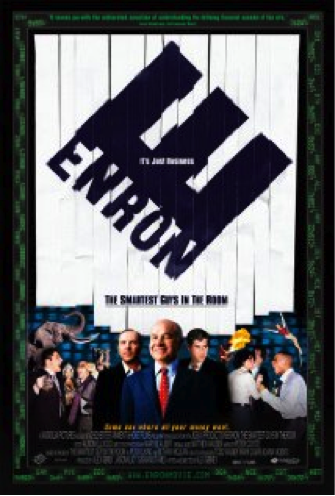 “Enron – The Smartest Guys in the Room” is a brilliantly made movie that watches more like a crime investigation than a political or business documentary. Are you one of the 10.6 Million ? 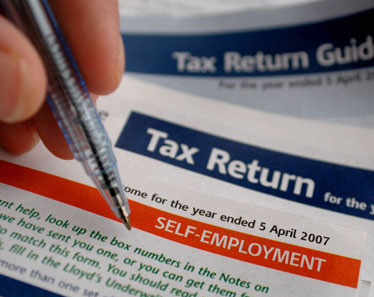 Are you one of the 10.6 million UK citizens who should be submitting a personal self-assessment tax return? If so, then you have very little time left to get your return in for the 2011-12 tax year. The deadline for submitting these tax returns electronically is 31st January. Miss the deadline and it’s an automatic £100 fine, even if no tax is due. Here is the first in a series of ten movie recommendations. Be sure to check back for the rest of the series. Since the global financial crisis began in 2008, there have been countless books written that have attempted to explain just what caused the crisis and what can be done to prevent it from ever happening again. 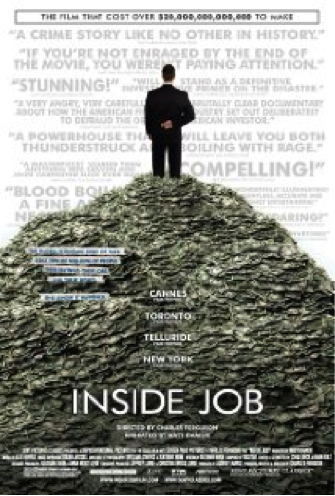 ‘Inside Job’ is a movie that takes on that challenge to inform the viewer through a series of interviews with financial insiders, journalists and politicians, just what has caused millions of people to lose their jobs, their homes, savings, pensions and investments. Inside Job traces the rise of the international banking industry and its deregulation which has resulted in the worst recession since the 1930’s.